After three weeks, I finally am back to hooking!! This past weekend, I worked on my UFO for the Wool Snippets challenge ~ not a lot but at least a little progress! Last night, I started a small pattern ( 10 x 15 ), which is an enlarged version of one of my starter patterns for beginning rug hookers ~ and it's also a good pattern if you need a small project or gift for someone! The star motif was a little off kilter and had to be moved, so it wasn't something I could offer for sale ~ the next best thing was to hook it myself ~ it can be the example picture to attach to the pattern! The crow wool is a really dark hand-dyed burgundy ~ kind of a black cherry ~ so with all the variation of color and a plain black strip for the wing distinction, it hooked into a nice looking old crow!! There is a nice buttery-feeling, kind of neutral plaid that appears to be a good background wool ~ I'll give it a try tonite! I hooked for about an hour, while watching Dancing with the Stars and will do that again tonite. I miss it when I put the hook down for too long and am trying to put into practice the goal of hooking a little every day!! As with most of my good intentions, it's difficult ~ but it won't happen if I don't give it a try!! We had a most fun weekend at the lake ~ Friday night, we were left to our own devices, as all of our lake friends were in other places!! We went to Mon Ami winery for the free food at happy hour ~ then went on to a Japanese restaurant and ate in the sushi bar (no sushi for me ~ a lovely lump crab & avocado parfait and a fire-roasted lobster appetizer ~ YUMMY!) ~ Sonny had sushi and sea bass ~ we were quite happy when we left!! Then a stop at some other friends where we watched the debate (sort of) and a stay that was way too long!! We decided that Friday night would be our belated anniversary celebration since Thursday night, we stayed home and ate brussel sprouts, beets and redskin potatoes for our supper ~ that was an event!! Saturday, Sonny's daughter and two of her girlfriends came up for a night out! We had cosmopolitans on the rocks (you know how we like to rock-sit) and then to Mon Ami for dinner and dancing!!! The old guy and I danced till one in the morning to the Traveling Lounge Lizards!!! We had used a local taxi service for the coming and going and we were so happy to have them pick us up!! The next day, we put the girls in the back seat of the car and drug them around Catawba and Marblehead ~ in and out of shops and showing them the local sights!! It was a fun day and they all had a great time ~ a short weekend without their kids and time with such fun parents!!!! I heard one of them say (I think Sonny's daughter) "they're so cute"!!!! We're cute alright!! At least, we are still able to shake a leg on the dance floor!! Office work awaits but I just had to post this ~ my 'intention' was to blog every day or so, but it's hard to find the time and the subject matter ~ well, not if I write about every dumb thing we do!! Hope all is well with you! Ta ta for now! What a weekend!! It took me until yesterday to recover!! We really did have a good time but between being one of the planners and hosting our own party Friday night, it was a really big deal!! As I said before, we were a small class so on Friday night at our condo, there were twelve of us, including a couple from China and one from Alabama! The van dropped them at our condo at 6:15 and picked them back up at 1:45 a.m.!!! We ate, we laughed, we drank adult beverages!! The lobster chowder went over very well ~ whew! I worry when trying out a new recipe! I've had several requests for the Pecan Bar recipe and have tried to figure out how to have a link to it here but so far, this techno-impaired brain doesn't get it!! So, if you would like to have it, email me at gfraizer@neo.rr.com and I will send it along. They were pretty darned scrumptious ~ I took the leftovers to my neighbors on Sunday evening (they had guests from Venezuela!) and they all liked them very much!! At our Saturday gathering at the lodge, I proposed a "65th birthday party" in 2010 as most of us will turn 65 sometime during that year. I borrowed the idea from my husband's class and our group latched onto it and ran with it! My thought was to have it at our home on a Saturday ~ no frills ~ maybe I would cook, maybe they would bring food, maybe we would have it catered ~ and for sure a birthday cake!! By the end of the weekend, they decided they would bring their motor homes, campers (someone suggested tents - not good) and spend the weekend!! So there we have it ~ another big party!! It works for us and we're looking forward to it!! As you can tell, a good time was had by all at our 45th reunion including the nice couple in the above picture!! Last night I went with a friend, to a spiritualist church about an hour from here. The church people serve a great dinner for $4 and then have a 'message service'. The 'messages' come through the pastor from the 'spirits' on the 'other side' that are guiding us or want to contact us!! I had been there with her quite a few years ago and interestingly enough, one of messages that I received last night and the time before, was that there is a nursing vibration all around me, sending energy thru me! My mom was a nurse and both times, that is the first thing that is mentioned!!! Spooky, huh?! And I have an Indian guide who says to let my mind be open to overall wellness and that I have a sense of direction in my life!! Isn't that wonderful news??!! Since I plan on living a long time, that made me pretty happy! It was a fun evening ~ a person can take from it what appeals to them and leave the rest there ~ one recurring theme was that we each own our own happiness!!! Pretty profound, wouldn't you say?? We don't need a spirit to tell us that! I'm trying to catch up on office work, laundry, etc. It's a beautiful day here in Ohio ~ maybe the garden is calling me!! Oh, I almost forgot ~ today is our 26th Anniversary ~ we exchanged cards this morning and both of them had stars on them ~ I wonder if we're becoming just alike ~ scary!! It's hard to believe that the winds from Hurricane Ike could blow so hard here in Ohio ~ but on Sunday, they did!! These big poplars at the back of my husband's shop blew down like matchsticks along with several other trees that really looked more twisted than broken off ~ like a mini tornado!! They crashed into the shop ~ hitting the roof so hard that it broke rafters but didn't go thru the standing seam roof ~ tore down spouting and fascia boards and drove a tree limb through the garage door to the storage area! The tree guys are coming this morning to cut up all the debris and then we'll be able to see what the real damage is under all that mess. But all in all, it was nothing compared to what the people on the Gulf experienced and we're so fortunate to have insurance (my son is our agent ~ thank you, Teddy!) and a husband who can restore his shop to good as new condition!! We were at the lake, so Sonny's son, Brian, kept us informed by phone and sent pictures ~ and used his chainsaw to cut up the big limbs that fell across the drive out by the road, so we could get in when we got home!! Yeah, Brian!! The electric was out until the middle of the night ~ no big deal ~ some of our kids didn't get their electric back on till last night! And many are still without, even in our area and all around our state. The internet and cable was out till late Tuesday night, so I missed blogging immensely ~ so much to write about and no connection to cyberspace!! On Tuesday night, I did take the laptop to Panera Bread and check email after we ate and I even used my dentist's internet earlier that day (my daughter-in-law works for him so she helped me out)! This weekend is my 45th class reunion ~ eeee gaddd ~ how can that be?? My friend, Pat and I are the coordinators ~ we had a very small class in a consolidated school ~ but it is still a lot of work to put it together and get people revved up so they want to come! Some of us spend the weekend at a state lodge up on the lake and others join us just for the Saturday evening meal. On Friday night, we are hosting a supper at our condo ~ it's 25 miles from the lodge ~ and thanks to a benefactor, we will have a van pick up and deliver the guests so no one has to drive!! So right now, I'm baking Pecan Squares Americana ~ a pecan pie in the form of a bar cookie on a shortbread crust!! Sooo good! Then I'm making Lobster Chowder, from a recipe in the new Coastal Living magazine ~ it looks yummy ~ I'll let you know. It's kind of a big project to make and a little pricey ~ but my old friends are worth it!! I'll get those two things done today and do the rest of the menu tomorrow afternoon at the condo. I still have to shop for snacks for Saturday afternoon at the lodge ~ we rent a facility on the property to use as a hospitality room ~ so Pat and I are sharing shopping duties to stock that! Last night Pat and I attempted to print our reunion booklets at her office and that turned out to be such a fiasco that I brought them home to do on my copier ~ I think Pat wanted to run away after all the complications!! At 11:30 this morning, I pick up Miss Luci (remember my little dancing chicken?) from kindergarten, pick up some lunch for her, take her with me to get my face sanded (microdermabrasion), take her with me to get my nails done by her mama (who owns the shop and also takes very good care of me!) and then we have a homebuilders meeting tonite ~ a tailgate party at one of the members homes!! As you can see, never a dull moment in my world!! That's what keeps my ticker ticking, I guess!! I hope all is well with all of you out there ~ this is a crazy time in our lives and our country ~ I hope the nonsense I write about brings some laughter to you and makes you think ~ Lord, I'm glad I don't have to live with that woman!! 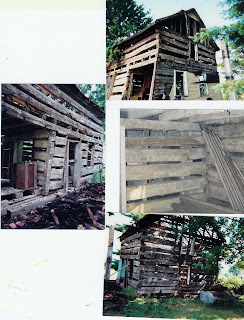 When we purchased this antique log cabin several years ago, it was with the intention of putting it up in the lower part of our property. We were going to use it for a shop for antiques and folk art or maybe just a place to gather when we have bonfires and camp outs with the kids. But things change ~ we change ~ and now that we go to our lake place so many weekends, it has lost it's appeal! It would be a lot of work and expense to get it up and finished so we've made the decision to offer it for sale. We're letting people know that we think would be interested and of course, the blog reaches people far and wide that we don't know ~ so it seemed like one of the places to post a notice. It's all tagged and numbered and the fellow we bought it from gave us an album with pictures detailing the dismantling and a grid system for assembling it, just like lincoln logs! He dated it back to 1865 although he thinks it might be older! It's 18' x 24', mostly oak logs, has some flooring, and we had cottonwood trees milled right here on our property to use for the roof sheathing. If anyone is interested, email us at gfraizer@neo.rr.com and we'll answer any questions! Today is a quiet day here ~ the wool room is still not completely organized ~ today I'm the laundress and the office girl!! I'd rather be hooking!! Have a good day all and hopefully, there's someone out there who wants to buy our log cabin!!!!!!!!! Besides, I had to get another picture up there to replace that one of us at the show!! Okay ~ here we are ~ me and the old guy (that's what I like to call him!) near the end of the show!! Our day began by driving the hour long trip in a driving rain!! I was pretty discouraged and thought we might like to go back home ~ but of course, I would never do that!! We set up in the rain and covered everything at the edge of the tent with plastic and tried to work around all the crates and each other in harmony!!! And we did!! Just before 10 a.m. one of the other craftsmen said to look in the West ~ there was blue sky and it was on it's way!!! Yippee!! Wished I had taken pictures of the booth when it was all stocked and neat but it was all coming together too fast!! The weather shaped up ~ the shoppers came ~ they were very generous in their wool buying and the pieces of Halloween folk art that I brought along found new homes!! Also sold some funky mirrors I had picked up several years ago! So I was a happy woman!! We had to set the booth up a little differently than usual, so everything would be at the back of the space rather than at the outside edges of the tent ~ but it worked out great!! We ended up standing a good bit of the time ~ I think Sonny put our chairs out around 2 o'clock ~ because we were really busy and had no time for sitting! Of course, we know lots of people ~ rug hookers and people from my hometown, which wasn't too far away, and I met face-to-face a local gal whose blog I read and she reads mine!! That was fun! We have some mutual friends too ~ one being my daughter-in-law, Cheryl. It's just so much fun to see so many faces that we know and even though we didn't all get to talk to all of them, I knew they stopped by!! We skipped the meal that is provided after the show, because we had an anniversary party to attend as soon as we got home!! We were both so tired that we fixed a cocktail and grilled cheese sandwiches and called it a night!! I can't believe it!! I hate when that happens! But sometimes you just have to 'say uncle' !!! Today, I'm putting the wool room back together ~ putting everything back in the cubbies and baskets and bins. And I'm working in my supply closet where there is so much cotton fabric from when I was a doll maker ~ I'm shifting some of that around and making room for my own personal stash of wool and patterns, etc. so that it's not stored right next to the wool that's for sale. You know how that is ~ I have to make more of mess to get to the end result of a neat wool room again!! Up to my ears in wool ~ that's when I'm happiest!! I found a bolt of yellow cashmere that I bought a while ago ~ so I'm washing that today and will work on dyeing some of it!! Also found a bolt of vintage mattress ticking that is very nice. I like to use ticking as a binding sometimes ~ so that was a nice little find!! And I have to lose 50#'s in the next two weeks ~ IT'S CLASS REUNION TIME!!! I should stay on the treadmill for the entire time ~ that might work!! Oh, oh ~ detour ~ my friend, Heidi, just called to meet she and another friend for lunch!!! Yesterday's dyeing!! Lots of rusts, antique red, golds and greens!! I think because of Fall approaching, the rusts and reds really appeal to me!! Enough already!! I was going to put on a couple more dye pots this morning, but I think I'm done now!! It's rainy and gloomy out (we need the rain and I'm so glad it's today and hopefully, NOT TOMORROW!!) that I just decided that I'll concentrate on getting all my stuff together ~ tables, crates, bags, plastic drop cloths (insurance against the rain!) and fold more of the as-is wool!! I sure hope lots of shoppers come by 'cause this girl is ready!!! I started this piece last Sunday and have worked on it a bit each day, finally finishing it late last night!! It's a combination of proddy and hooking with lots of texture in the grassy area achieved with wool and a heavy dyed yarn and a bit of a fine velvet ribbon. I used some antique paisley in the stem and the moon, as I did in one of the purses ~ I'm really making an effort to use different fabrics and techniques in an attempt to expand my hooking. It's very easy to do what we know and I'm trying to challenge myself to be more creative! We'll see how it goes!! Back to the hooking room!! This is kind of an interesting piece that was in the dye pot last week! A gal that I met at a fabulous yarn shop outside Marblehead, told me that she dyes with all kinds of natural things and one of them was rhubarb leaves!! There were still a few stalks of rhubarb remaining in the garden, so I boiled up 4 large leaves, strained out the mush that was left and put a piece of white wool in it and voila !! This nice soft yellow emerged ~ next year, I'll definitely try it again ~ using more leaves and more wool!! Interesting, don't you think? These are from last Thursday's dying and the colors are really beautiful! Yesterday, I got four batches done and also spent the day, cutting and wrapping many yards of as-is wool. I cut it in 1/2 yard pieces and then fold, roll and tie it in a bundle. There is really a lot of work involved in getting ready for a show and I get so energized just trying to get it all together! I have done shows for over 27 years ~ in the years our kids were in college, I did between 15 and 20 shows a year! My husband is so happy that, now, I only do two!! I used to be a doll maker ~ cloth dolls, using vintage fabric, lace, buttons, etc. to fashion their clothes. They were primitive back before primitive got all the attention it gets now. I've made baskets, bears out of old quilts, shirts out of bluejeans with quilt yokes ~ if it sold, I made it!! But now, the rug hooking and the wool dyeing are the real love of my creative life ~ as I've said before, I wish I could hook all day, every day!! The show I'm doing Saturday is at Quailcrest Herb Farm, north of Wooster ~ if any readers are in this area of Ohio, it's a wonderful folk art show held in their herb gardens. There is nothing better than an outside show when all conditions are right!! And I hope they're right this Saturday ~ it's supposed to be mid 70's ~ which will be heavenly ~ and a chance of rain ~ which won't be so heavenly!!! We're hoping for the best!! At any rate, I'll have lots of nice, soft wool and some hooked pieces, my husband's frames, Hartman hooks, prodders, and a few odd things to offer ~ my booth is in the tent by the house ~ stop by and see us and say hi!!! Off to the dye pots! Well ~ I do have to sew an antique button on the back of each one but I'm so close, we'll call them done!!! These are for an order for a wonderful primitive shop that ordered some a couple of years ago ~ I hope she likes this years' offering!! Each one is a labor of love, really ~ they are labor intensive in that the wool backing has to to be hand-sewn on to the hooked front, the shoulder strap is machine stitched in between rows of hooking, then the lining must be hand-sewn in and hand-stitch the strap again so that it's really stable!! I've used as-is wool, hand-dyed wool and some antique paisley in one of them ~ making each one as different as possible. This is my own pattern ~ if you're interested, let me know!! This evening, I also posted my meager progress on the Unfinished Objects site ~ Labor day was the first deadline to post and only two little hands got hooked since the challenge began!! I'll do better next time! We had a long weekend at the lake ~ I did the finishing on the purses and also started a new hooked mat for my show, using this same basic pumpkin pattern. I'll post it tomorrow for you to see ~ I need to go to the hooking room and hook as soon as I'm done here. We hopped the Miller Ferry on Saturday and headed for Kelley's Island ~ it was an absolutely gorgeous day and weekend, for that matter!! We had lots of fun showing all the fun spots to the daughter and son-in-law of one our lake friends ~ between their parents and us ~ we didn't miss much ~ except the wondrous Glacial Grooves, that I just love to go see! They're stone formations left by the glacier that traveled across this land many thousands of years ago ~ on our property here at home, we have 'puddingstone' which is also left from the glacier ~ I'll show you a picture sometime! On Kelley's, we really needed to rent a cart to drive to the area where the 'grooves' are located ~ they're all fenced in and protected with signage periodically telling all about it!! Some of our friends aren't as enthralled with them as we are!!! Sunday and Monday were spent on the rocks or the deck, working on my projects and listening to the water lap against the rock wall!! The breezes were just great ~ no air-conditioning needed those days!! You girls are making me think I've got something here!! Ginger from Primitivesbythelightofthemoon.blogspot.com has given me this new award!!!! She has a great blog herself ~ lots of creative things on there ~ great pumpkins! Once again, I am supposed to name seven favorite blogs and I just can't ~ so I'll refer you all to the ones on the left and some that I will add soon ~ that are just fun and creative and all deserving of awards!! Thanks again, Ginger ~ who also goes by 'nyafarmgirl'! !